Saturday night millions of people in Egypt saw their hope for a short glimpse of happiness crashed when a young Egyptian footballer fell in a Kiev Stadium. That phrase spread on Egyptian social media to describe eloquently in Classical Arabic what millions of Egyptians felt when they saw their favorite football player and the top scorer of English Premier League Mohamed Salah fell in a Kiev stadium after his injury during the final football match in Europe’s Champions League between Liverpool FC and Real Madrid. Salah was the latest victim of Spain’s national team and Real Madrid’s Sergio Ramos. 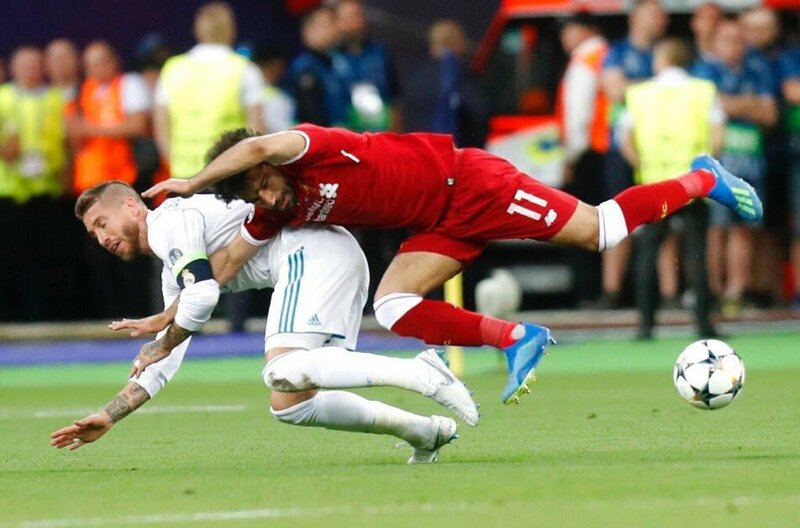 As if he were in a wrestling game, Ramos caused a Shoulder injury for Salah that forced him to leave the game after 30 minutes “heated 30 minutes” of the first half of the match. I did not complete the match after Salah’s injury and how the referees ignore it. There has been extreme fear that our Egyptian king may not be able to play the World Cup as part of Egypt’s national football team. If his shoulder is dislocated then he will not play in the World Cup. Update: Our golden boy spoke with his family in his home village in Nile Delta and said that his injury won’t stop him from playing in the World Cup according to Ahram Arabic news portal. Personally, I won’t be sad if Salah could not join the Egyptian National team in the World Cup because he is still young and can go with the team again hopefully inshallah. Needless to say, Spaniard Ramos is now top trending in Egypt and for all the wrong reasons. He is being called names in Spanish “I did it” and in Arabic, as you can see in an exhibit “1”. Egyptian tweeps are calling him SOB , dog and animal. The official Facebook page of Sergio Ramos is bombarded by angry Egyptians writing in English, Arabic and Spanish that he should quit football and join some martial arts game. People have not forgotten also that Saudi Arabia’s top sports official Turki Al-Sheikh have expressed at least twice publicly including one in front of Egyptian President Abdel Fattah El-Sisi that he wished not to see Salah in the World Cup as Egypt and the Saudi Kingdom are in the same group in the World Cup !! Al-Sheikh has got his fair share of curses in Egypt accordingly to the level that he has not shown up on twitter despite he is active Twitter user. As a football fan, I know that realistically with a fair play the odds will be in favor of Real Madrid due to its experience but I had hope that Liverpool and Salah would change the game once again and win. I wished that I would write about how Egyptians celebrated Liverpool and Salah’s victory in Tahrir square but fate had another say. Ironically I only feared that Egyptians would wake up on Sunday to find a new increase in fuel prices. Anyhow I know some sophisticated people will attack those millions of Egyptians because they do not get angry because of their miserable life and get angry because of the injury of some footballer. I would like to say that that footballer is probably from the very few things that unite us as Egyptians with the happiness and hope he brings to us in those hard times.